Tokyo is a beautiful city. I attended 2 days seminar by Dr. Tetsunori kimura and Dr. Fukumoto. The lectures were great. Many participants attended the Seminar and they seem enthusiastic. The contents of the seminar were very informative and fruitful. Kimura sensei gave important clues to make a histopathology diagnosis. All of which are based on his years of experiences. It was something that we cannot get from the textbook. For those who love dermatopathology or reviewing dermatopathology, I highly recommend Dr. Kimura’s seminar. After the seminar we had fellowship night at an Italian restaurant. I had the chance to meet other previous fellows in Sapporo institute, all of them were very kind. 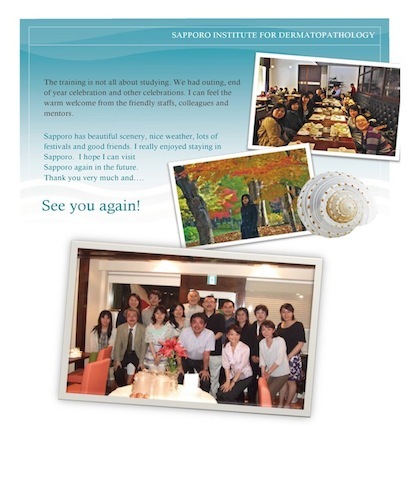 What I learn about the fellowship night was Kimura sensei treats his fellows like a family. 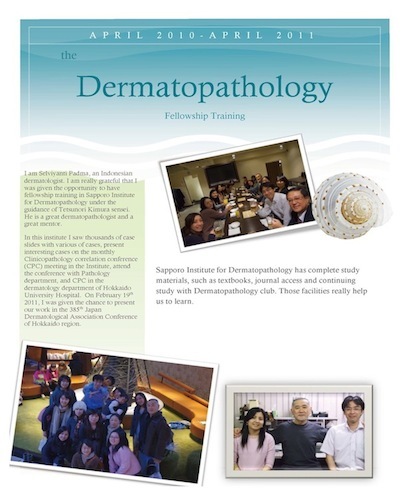 Sapporo institute for dermatopathology is a great place to learn dermatopathology. Not only because of it has a great mentor and most number of slides (cases), Kimura sensei also teach me to enjoy life by giving me 2 extra days to enjoy Tokyo. Kimura sensei toured us (Me, my husband, Sato san) around Ginza and simbhasi at night during our stay there. It was truly a memorable moments. I arrived in Sapporo on April 20, 2010. I was welcomed with warm welcome by Dr. Kimura, his mother and the staffs. Living in Sapporo and learning from a great dermatopathologist, for me, it’s a dream come true. The people here are very kind to me and Sapporo has beautiful scenery. Everyday is an exciting day. I see lots of histopath slides and learn a lot from the cases. Dr. Kimura is very accommodating. He explains the slides very clearly. Sapporo institute for dermatopathology has a highly sophisticated computer systems and complete library. I feel truly blessed to be able to learn in Sapporo institute for dermatopathology.